When I saw this origami skirt I knew I had to make it. The original pattern, which I purchased just before my holiday, belongs to a Burdastyle member. The original instructions show this skirt made of knit jersey. But I wanted the fabric to be more suitable for the hot and humid Japanese summer, so I used this beautiful quilting cotton. The fabric is not very stiff (as most of the quilting cottons are) and feels nice against the skin. 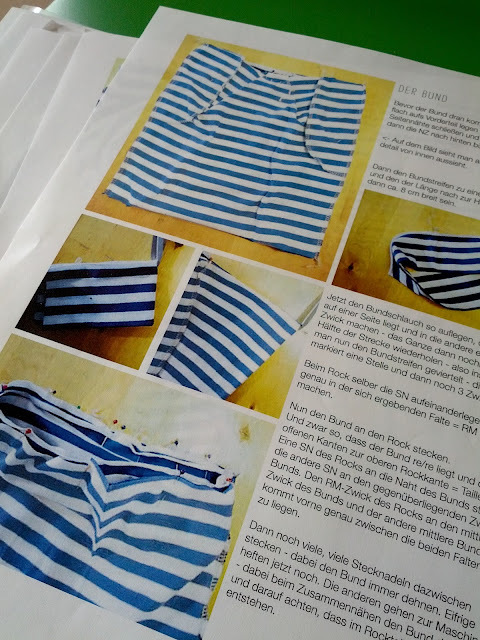 Due to many very detailed photos, the pattern and instructions are super easy-to-follow (the instructions are in German). As the original pattern suggested stretch fabric, the belt was just simply cut from a rectangular piece of fabric and attached to the skirt. For cotton, I had to draft a belt myself, and it took me almost no time. I decided to make a high-waisted kinda '50s-looking belt, and I was pleased with the result at the end. I also have to show off my beautiful sun-tan before it washes away, and a brand new haircut. My hair was chemically straightened because my curls and waves were driving me nuts and I did not know what to do with them, especially with hair as short as I like to have. For the past 2 summers in Tokyo, I constantly looked like a sheep. My hairdresser said that it'll remain like this for 5-6 month!!! Guys, that's the best thing I've done to my hair since cutting it off!!!! But I made a huge mistake cutting the belt when my tummy was empty. After lunch in our favorite Thai restaurant, I had to breathe in for the photo-shoot ;) I'll increase the belt's circumference by 2-3 cm or so. By the way, what's your favorite cuisine? Your hair looks great! I know about this sheep appearence...when the weather is wet my hair also is transforming! 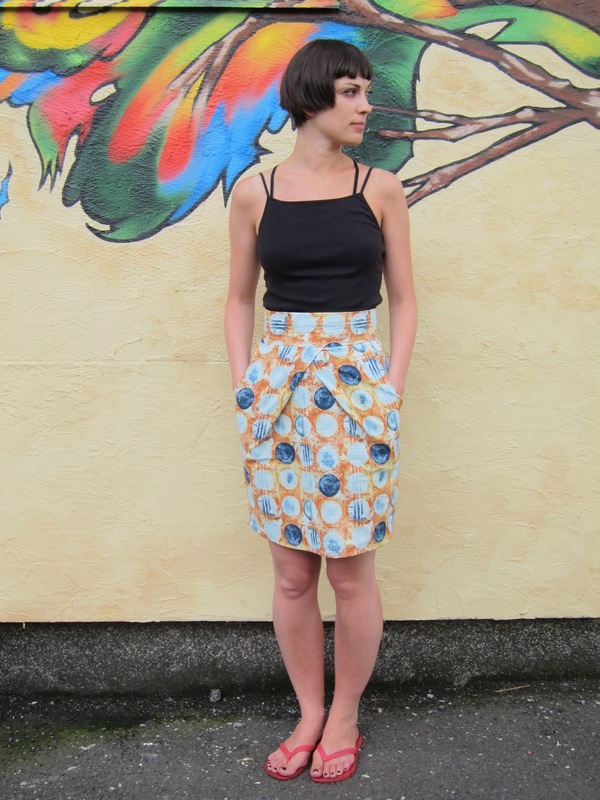 The origami skirt is so pretty, thanks for sharing the link! Apart of my country´s specialties, like grilled fishes or pot meal, I like to try all kinds of food. For example I have never eaten insects, in some countries of South America and Asia is very typical. I have to travel there to eat insects! You did a GEORGOUS job on the pattern! It looks sooo great - great fabric and perfect work for the waistband - I am mooooore than happy, my little pattern is used by you and now makes its way through Japan - THANK YOU! and a great hair doing anyway! Dear Dolores! Thanks for your kind words and for the great pattern :) I wish you had more patterns for adults! I love the fabric you chose! 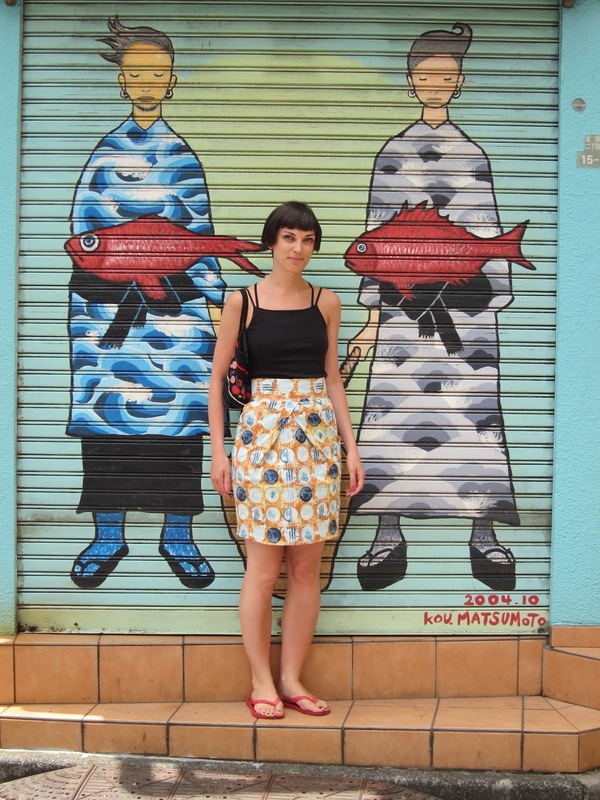 Cool skirt! Cute hair and FABULOUS skirt! Do you think it would be easy to make following the pictures if you can't read german? Yuuumm yumm! I am not a great connoisseur of the Chinese cuisine but would like to discover the authentic flavors one day! the internet users, its really really good piece of writing on building up new web site. I am having difficulties with your RSS. I don't know the reason why I cannot subscribe to it. Is there anyone else getting identical RSS problems? Anybody who knows the answer will you kindly respond? Thanx!! You are so cool! I do not suppose I've read something like that before. So good to find somebody with original thoughts on this issue. Seriously.. thanks for starting this up. This web site is something that is needed on the internet, someone with a bit of originality! an e-mail. I've got some ideas for your blog you might be interested in hearing. Either way, great blog and I look forward to seeing it expand over time. round exciting blog (I also love the theme/design), I don't have time to read it all at the minute but I have book-marked it and also added your RSS feeds, so when I have time I will be back to read more, Please do keep up the excellent work. I've been surfing online more than three hours as of late, but I by no means discovered any attention-grabbing article like yours. It is pretty value enough for me. Personally, if all website owners and bloggers made good content as you did, the net might be a lot more helpful than ever before. A fascinating discussion is worth comment. There's no doubt that that you need to write more about this subject matter, it may not be a taboo matter but typically people don't talk about such issues. not be a taboo subject but generally people do not talk about such subjects. Everything is vry open with a precise explanation oof the issues.